With Torchlight II due to launch sometime this summer (likely September, many fans believe), Runic Games addressed the community last week with two lengthy posts explaining the current state of development as well as what can be expected of the sequel. In response to feedback from May's closed beta, the company is spending many of its final pre-launch hours applying additional polish to elements such as the skill system. "Skills are made available for investment by level (just as they were in the tree), but their unlock level is no longer determined by vertical positioning in the tree, which gives us more flexibility to place them where we want them," Runic said. "In addition, you receive specific bonuses to each skill (apart from standard investment bonuses) at every 5 point mark, or tier, which are hopefully a good enticement to continue investing in a skill." In an example, projectiles shot from one of the Engineer's weapons begin ricocheting at 5 points, they pierce targets at 10 points and at 15 points, the projectiles are tripled. In-between those tiers, other attributes such as damage also increase. Runic stressed that it "didn't remove cool stuff from skills and ball it all up to make the tiers neater." Additionally, passive abilities now have their own section so they can be unlocked earlier. Much of Runic's time is being spent polishing Torchlight II's acts, with focus currently on the second and third. This includes tweaking the abilities, health, damage, attack range, weapons, behaviors, spawn density, sound sets, death particles, and explosion particles of monsters players will encounter. "Often as we are polishing an act we find a 'gap' -- it feels like something new should be there. So we fill it," the company explained. Last week, for example, one developer writes that he polished 13 different monsters and gave them 12 new skills, revised spawnclasses for 6 different regions, worked on destructible elements for a sewer area, made various particle systems, fixed multiplayer boss battle issues and more. To offer eager fans an example on the scale of Runic's latest undertaking, the company provided an infographic comparing it to the original game. 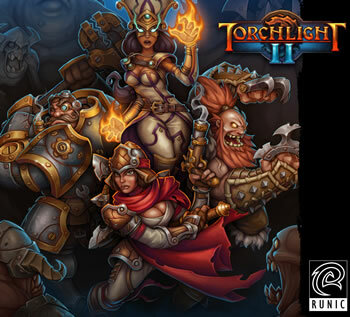 In terms of assets and approximate playtime, Torchlight II is said to be nearly four times the size of its predecessor. The new game has over six times the number of unique areas, and over 200% more monster models, unique monster variants, monster abilities, boss battles, room layouts, room pieces and musical tracks. There's also a boost unique player skills and items such as unique wardrobe sets and weapon models.